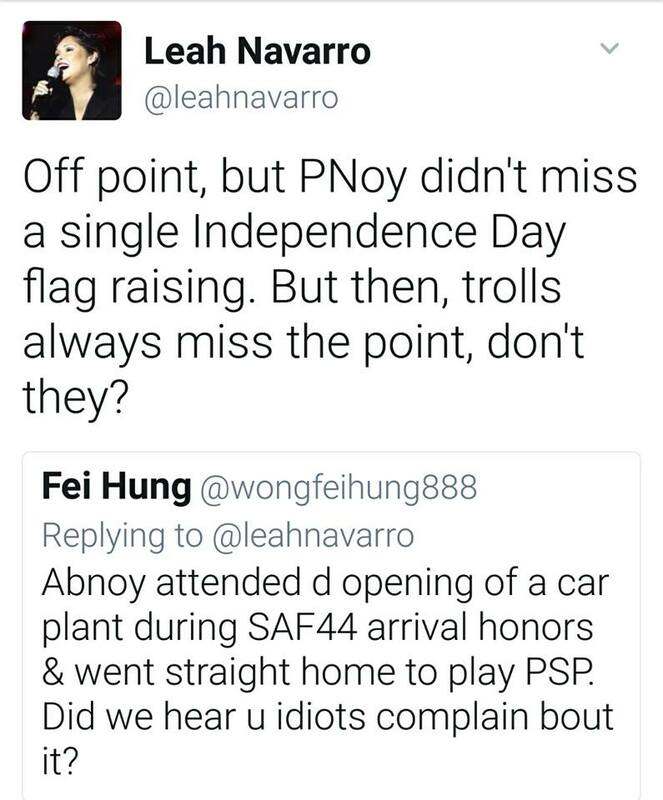 It was reported that Leah Navarro got into hot water for tweet that said that PNoy didn't miss a single independence day celebration. The result went awkward with people attacking her as well as Maria Ressa of Crappler and Raisa Espinosa-Robles for their latest comments. She had an interview with frustrated first lady wannabe Korina Sanchez-Roxas that went viral. This is a great slap against the Filipino tradition of fiestas. By not attending the flag raising Duterte has shown himself not to be a Filipino. Would have it been your husband Marbobo Roxas he would have attended it. Fiestas are part of Filipino culture and Filipinos can't do without them. What's wrong with attending fiestas during a time of war? Fiestas are part of Filipino culture. We Filipinos know how to have a good time. Even if a barrio is at civil unrest but the barrio fiesta must go on. Even if there's a bombing fiestas must go on. We must celebrate them in even in times of civil unrest or we will lose our Filipino identity. Would have Marbobo Roxas won, he would have prioritized the raising of the flag as part of the glorious Filipino tradition. The people in Marawi are just mountain people. I agree with what Jim Paredes said. If Marbobo Roxas won I don't think the crisis would have happened in the first place. 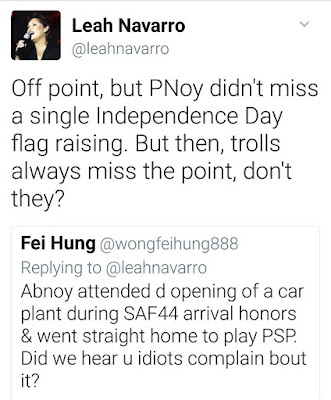 The situation escalated as more and more netizens attacked Leah's Twitter account until she had no choice but to go on a blocking spree.